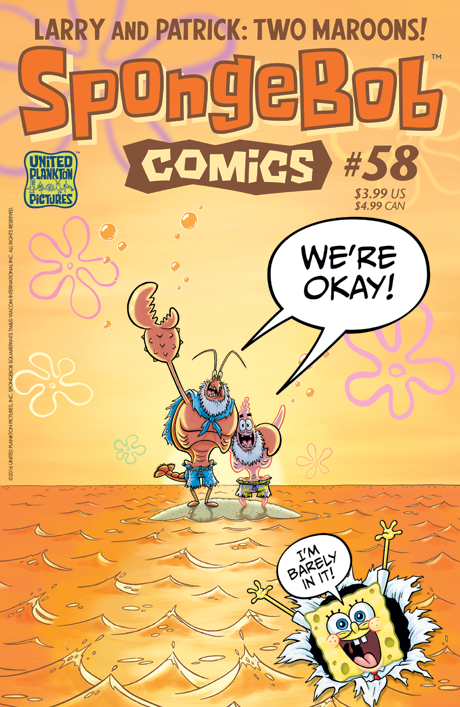 Patrick and Larry the Lobster are the "Crusoem Twosome" in a 23-page SpongeBob epic with only a little bit of SpongeBob! When Patrick's allergies cause him and Larry to be marooned far from Bikini Bottom, it's all Larry can do to keep his buff composure and rock-hard cool! Will sea monsters, tidal waves, and a distressing lack of free weights prove deadlier than…being stuck 24-7 with Patrick? PLUS: SpongeBob catches a magic jellyfish; Gary loses his bowl, a new “SpongeFunnies” from James Kochalka; and more ocean facts from Maris Wicks!